Chief of Army Staff (CoAS), Lieutenant General Tukur Buratai has donated desks, chairs and sporting equipment to Onu Ibina Primary School, Onu Ibina Community in Bende Local Government Area of Abia State. The gesture of CoAS, was to further strengthening Civil-Military cooperation aspect of the Nigerian Army (NA). The items include tables, desks/chairs (100 pieces each) and sporting equipments – 4 × footballs, 3 × handballs, 3 × volleyballs, 2 × volleyball nets, 3 × basketballs and 1 × table tennis table with 4 × pairs of bats, 2 × tennis net and 10 × table tennis balls. The Army Boss also approved the immediate renovation of three classrooms of the school especially the ones with worn out roofs and dilapidated structure and ceilings. Presenting the donations to the benefitting school on behalf of the CoAS during the closing ceremony of NA Sports Festival, 82 Division Chapter on Thursday, General Officer Commanding (GOC) 82 Division NA, Major General Emmanuel Kabuk restated the commitment of the force to protect national territorial integrity. 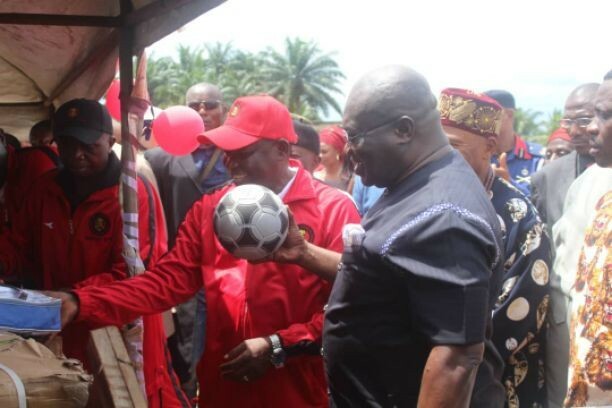 The Governor of Abia State, Dr Okezie Victor Ikpeazu received and handed over the items to the School authority. n behalf of the community, the Governor thanked the CoAS for the kind gesture that would enhance the Civil-Military cooperation between the NA and the good people of Abia State.